Do a film in Paris and right off the bat; you've added a certain je ne sais quoi. 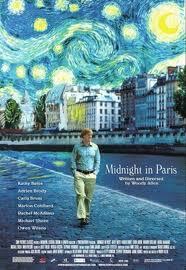 Have that film done by Woody Allen and you have a magical work of genius. How does the man keep doing it? Good or bad, Allen is good. I'm not sure a spoiler is going to be a spoiler because when you see the film, if you see it - How are you not going to see it after this review? - what you are going to see will not be diminished by what I tell you. Why? It's Paris for God's sake! Owen Wilson plays a hack screenwriter Gil from Hollywood vacationing in Paris with his girlfriend planning to be his wife and her parents. Gil has written his first novel with the idea of moving anyway from his financial success in movie town to something more rewarding artistically, but has doubts. Out for a walk one night when the clock strikes midnight, he meets some unusual people and discovers he's been transported back in time to the Paris of the 1920's, something he has always thought as being the most romantic of eras. He meets an astonishing array of now famous people. It is funny to see real life characters in the film: Gertrude Stein, Ernest Hemingway, Salvador Dali, F. Scott Fitzgerald, Luis Buñuel, and Pablo Picasso. My goodness, if Paris isn't already romantic, what else could add to its reputation as such then seeing such luminaries in La Ville-Lumière? This is Mr. Allen's 41st cinematic endeavour billed as a romantic comedy. It is charming and amusing. It has wit and grace. And it's Paris, oh how it's Paris. Excuse me if I now go off on my own personal tangent. I have read about Paris; I have read about the above mentioned famous people and the other eras when yes, you could walk into a restaurant or a party and look around a room to see, as Gil saw, a list of artistic giants that would make anybody's jaw drop. It is another era; it is anything but the mundane present with its pedestrian problems. Oh how we romanticize other eras or other cities or other cultures. And that seems to be the message of the film. Life isn't always good; life isn't without problems. And even if another era, there are still problems to be solved. True story. I lived in Paris as a student for part of 1980 in the 16th arrondissement. I had a room on the 6th floor and occasionally I would buy myself a bottle of cheap wine, some bread and cheese then sit by my window looking out on the street while listening to jazz on the radio. It was everything I had imagined Paris to be as a centre of all that is romantic and artistic in the world. I remember somebody saying to me that Paris was dirty and my response was, "But it's Paris!" For me, having been to Paris several times, it was a joy to watch the various scenes of the movie. Paris is a fabulous city; one of the great cities of the world. Having the main character go back in time made chuckle thinking about how to film this. Why? Think about it. Paris is old, like really old. Many of the buildings are older than Canada, yes older than the country of Canada. In order to portray a street scene of the 1920's, all Allen had to do was change the cars. The rest of it, the street, the buildings, the lampposts, etc. were more than likely the same as they were back then. I always laugh when we talk about museums and old stuff here in North America. There were people living in Europe dating back thousands of years. That's thousands, not hundreds. All the players were superb and considering the number of recognisable faces, I would wonder if these people sought out the Allen for a part as opposed to Allen asking them. Of special note, making her film debut was one Carla Bruni. If that name doesn't ring a bell, she is the Italo-French songwriter, singer and former model who married the President of France, Nicolas Sarkozy, in February 2008. Paris is known as the City of Love or the City of Romance. But its most famous nickname, "La Ville-Lumière" ("The City of Light" or "The Illuminated City"), comes first from its fame as a centre of education and ideas during the Age of Enlightenment, and later from its early adoption of street lighting. If you enjoyed Mr. Wilson's performance, if you enjoy him as an actor, be grateful that he was unsuccessful and has hopefully sought help. On August 26, 2007, Owen Wilson, reportedly suffering from depression, attempted suicide. (Wikipedia) Thank goodness he didn't. I thought he was good in this film. I thoroughly enjoyed this film. Rotten Tomatoes gives it a rating of 92% and that score is well merited. This is a film with a touch of class and a bit of heart. It is an entertaining romp through a beautiful city which evokes not just romance but imagination. The film was premiered at the Cannes Film Festival in May 2011 and festival director Thierry Fremaux said, "Midnight in Paris is a wonderful love letter to Paris." I now know why and you should too. Midnight in Paris is an American and Spanish romantic comedy film written and directed by Woody Allen, premiered at the 2011 Cannes Film Festival in May. It is produced by Spanish group Mediapro and Allen's Gravier Productions, and stars Owen Wilson, Marion Cotillard, Rachel McAdams, Kathy Bates, Carla Bruni and Adrien Brody. "Midnight in Paris est une merveilleuse lettre d’amour à Paris. C’est une œuvre dans laquelle Woody Allen approfondit les questions posées dans ses derniers films : notre rapport à l’histoire, à l’art, au plaisir et à la vie. Pour son 41e long-métrage, Il fait à nouveau preuve d'une belle inspiration" - Thierry Frémaux : délégué général du Festival de Cannes. As far as english speaking people are concerned, this is spoken by snooty types as to sound more sophisticated than they are, used humorously as such by people who *do* know what it means, and spoken by French when they need to say "I don't know what" in French. Generally speaking, can be used if you're feeling particularly suave to give an explanation of something of a certain unknown or indescribable quality.